One of the challenges to treating cancer is that it’s part of a supportive living body – welcoming blood vessels often reach out to feed the cancerous tissue, a process called angiogenesis. And just as each of our bodies develop differently, so do tumours, complicating the design of drugs, or surgical procedures. 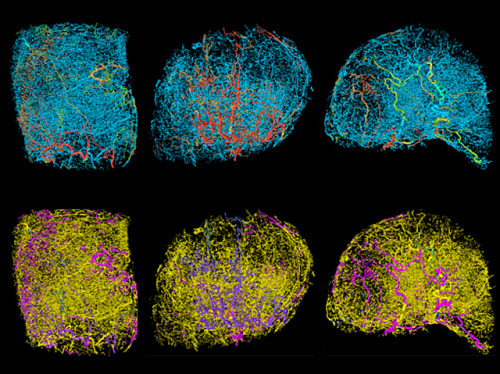 Here a new combination of 3D magnetic resonance microscopy and computer modelling investigates the differences, or heterogeneity, of three breast tumours growing in mice. The top row highlights different patterns of blood vessels in similar cancers, with regions of fast flowing blood highlighted in warm colours. Below, pinks and purples show the corresponding oxygen levels in the blood supply. Learning more about the haemodynamics of different tumours, may reveal more about what they have in common – creating a sort of ‘cancer atlas’ and identifying weaknesses for future therapies.